These four chords when played with a bar will allow you to move them along the fretboard. This will present the entire Major and minor chords possible to your repertoire. The first two chords below are called root 6 bar chords because the follow the notes of the 6th sting, the lowest sounding string, the other two are the root 5 chords following the notes of the A string or 5th string. Root 4 bar chords would follow the 4th string, or D shape up the fret board. 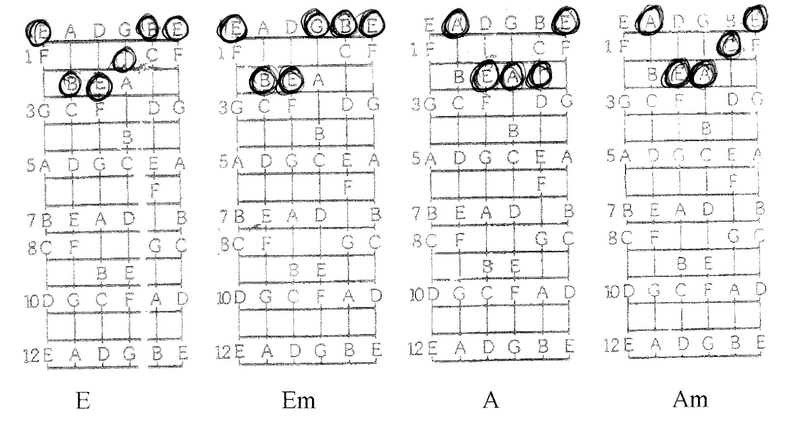 When the four basic bar chords shapes have been practiced it is important to recognise where the I, IV and V chords are situated in relation to your starting position. You will find that both Major and minor chords will be in the same relative position.